Republican Donald Trump and Democrat Hillary Clinton were the big winners Saturday in the latest round of U.S. presidential primary voting. It was a clear victory for Trump in South Carolina after a brutal primary campaign in which the top contenders traded charges of lying and political dirty tricks. “There is nothing easy about running for president, I can tell you. It is tough, it’s nasty, it’s mean, it’s vicious. It’s beautiful. When you win it’s beautiful and we are going to start winning for our country," Trump said. The billionaire businessman outpaced rivals Marco Rubio and Ted Cruz, who effectively tied for second, as Rubio surged to a strong finish with help from Nikki Haley, South Carolina’s popular governor. “Tonight here in South Carolina the message is pretty clear. 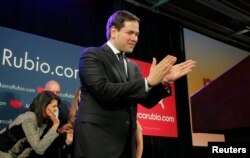 This country is now ready for a new generation of conservatives to guide us into the 21st century," Rubio said. U.S. Republican presidential candidate Marco Rubio applauds as he approaches the podium to speak to supporters at a South Carolina primary night rally in Columbia, S.C., Feb. 20, 2016. Cruz cast himself as the only true conservative left in the race. “You can go with Washington deal-makers or we can stand together with a proven, consistent constitutional conservative and bring back ‘morning in America,' " he said. Trailing well behind were John Kasich, Ben Carson and Jeb Bush, who decided it was time to drop out of the race. "The people of Iowa and New Hampshire and South Carolina have spoken, and I really respect their decision. So tonight I am suspending my campaign," Bush said. In the Democratic race, former Secretary of State Clinton held off a last-minute surge by rival Democrat Senator Bernie Sanders and won a narrow victory in the Nevada caucuses. 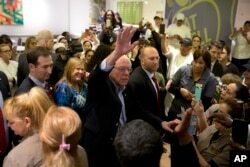 Democratic presidential candidate Sen. Bernie Sanders of Vermont waves to hotel workers at MGM Grand hotel and casino in Las Vegas, Feb. 20, 2016. “I am on my way to Texas, Bill is on his way to Colorado and the fight goes on! The future we want is in our grasp! Thank you all! God bless you!” Clinton told supporters at her victory rally. The win could give Clinton a boost ahead of next week’s South Carolina primary where she is already favored. Contenders from both parties now prepare for the so-called Super Tuesday primaries and caucuses on March 1 when 13 states hold nominating contests with hundreds of delegates at stake. Clinton Celebrates Victory in Nevada; Trump Takes S.C.